Innovative demonstration: Making the final sample. After testing and experimenting with two differnt techniques this lead us to develop our final design. I collaborated with my team mate both of us taking ideas from our designs. 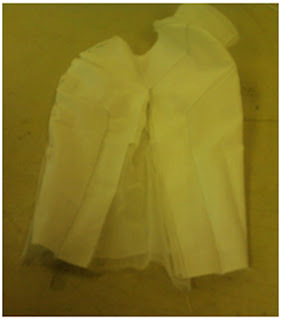 We altered the first experiment by changing the bodice shape to an oval tube (half scale). Panelling was introduced in order to add structure to the garment, by using bigger geometric shapes. This helped to make the pattern aspect cutting of the garment more visually appealing. The front bodice shows the two armholes and cuffs which we kept from the original experiment. On the sides of the bodice the panel interlinks to the armhole because the top of the panel curves to the armhole. The cuff is within the Panel. Over the cuff the stitch line goes upward at an angle, the stitch is connected to the panel attached to the armhole. Under the cuff is a long dart that goes all the way down to the hem. The neck is shaped like a half circle. 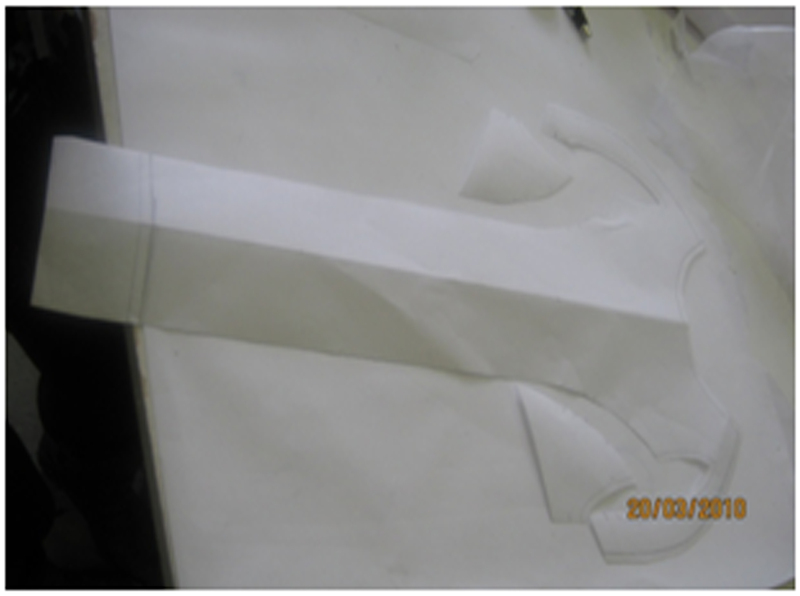 By cutting and separating the panels to add seam allowances create structure to the garment. The Panels will be stitched back together by a French seam. The Image above is the centre panel this was separated from the side panels; we added a 0.5cm seam allowance (half scale). 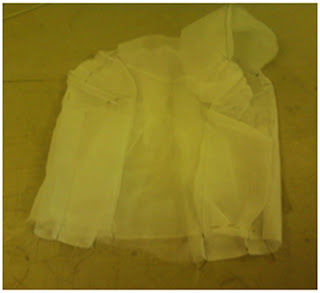 The armhole is dismantled because a part of it is on a different panel. 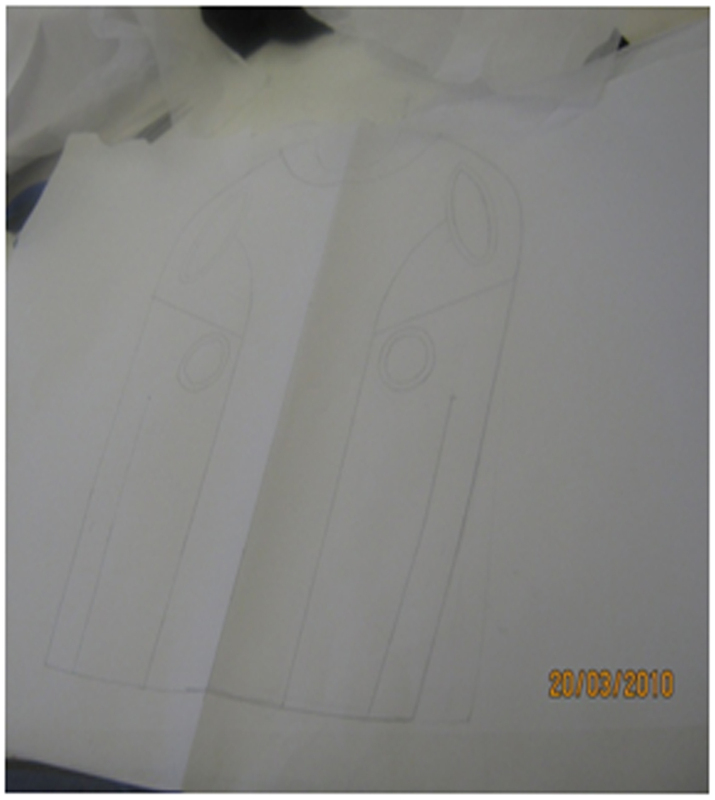 The image above shows the side panels, they are separated from central panel within the bodice, and again we added 0.5 allowances (half scale). The Darts starts with a 0.5 seam allowances at the hem and ends without any seam allowance at the top of the garment. 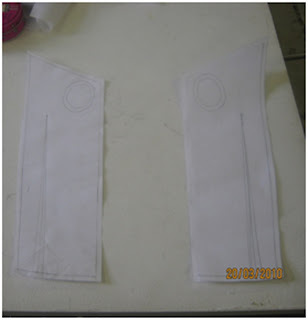 0.5 seam allowances are also put on the cuffs. 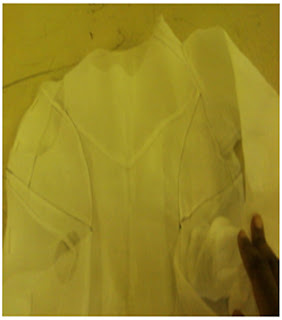 The sleeve keeps the same shape from the original experiment but is elongated to produce a ruche effect when the garment is worn; a 0.5 seam allowance was added. The Back bodice has a box pleat sewn into the back yoke in a v-shape. The side panels are separated from the box pleat panel to add a seam allowance. The box pleat has hidden fabric within, thereby the fabric will expand more, when worn and showcased in certain positions, i.e. stretching and bending over. The v-shape yoke has seam allowance added and also the back of the neck. 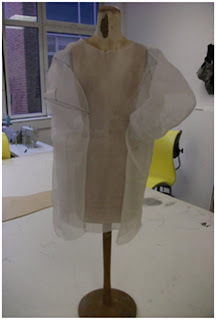 The fabric we used to make the garment was white transparent Organdie and Silk Chiffon (half scale). 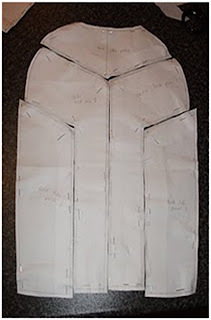 The organdie fabric was used to stitch the panels together for the front bodice. 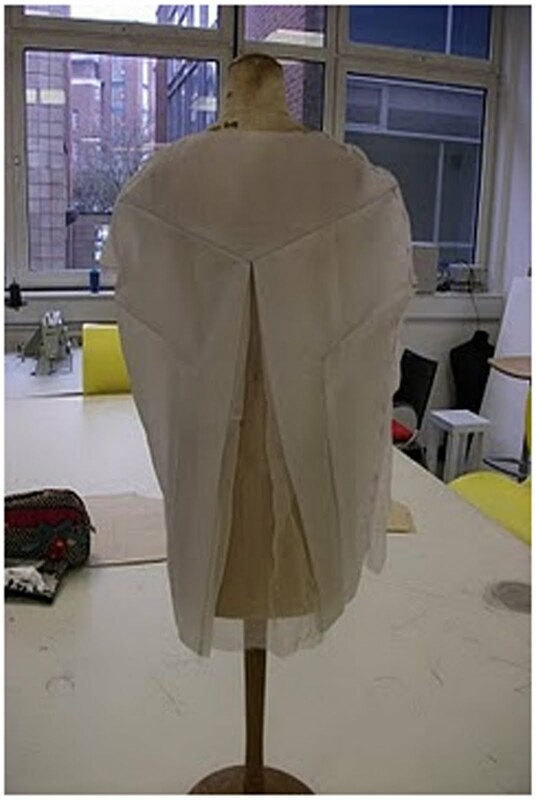 Silk Chiffon fabric acted like pockets because it was stitched within the side panels under the cuffs, adding drape and contrast because the pattern was three times bigger than the space of the panel to maximise drape. 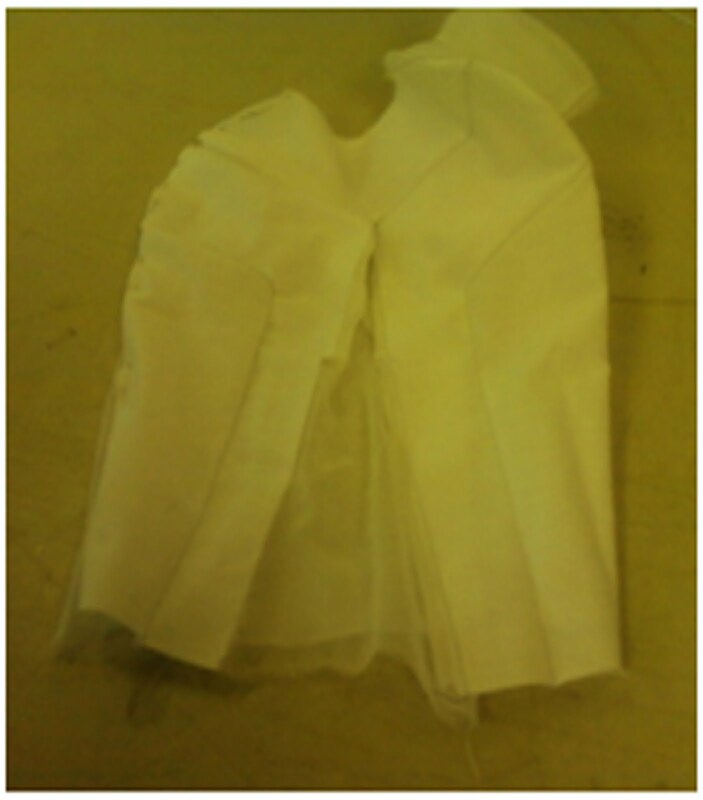 The sleeves were made out of organdie. The back bodice panels was made out of oragandie except from the silk chiffon pleate within the box pleate. The weightlessness of the silk chiffon pleat contrasts with the structure of the oragandie panels. The final sample garment on mannequin front view. The final sample garment on mannequin back view.